Home » Forums » Game Design » Game Design Showdown » [GDS] February 2011 Game Design Showdown - "The Dice Gods Must Be Crazy"
Mechanics Restriction: None! Be as creative as you like with the Components allowed by the Component Restriction this month. Component Restriction: The goal of this month's Showdown is to create a game comprised primarily of dice. You may use standard 6-sided dice, standard polyhedral dice, or custom dice. You may use as many dice as you like, but keep in mind that a realistic publishing limit will come into effect sooner or later, so it might be good not to go over 36 or 40 dice. Submissions: Friday, 18-February-2011 through Sunday, 6-March-2011. Voting: Through Thursday, 11-March-2011. PM your votes to sedjtroll. You may not assign any votes to your own entry! You may not assign more than 3 votes to any single entry. You need not assign all 6 votes. BOOM! is a dice game loosely based on the idea of trying to defuse a bomb and avoiding it exploding in the process! Roll to see who takes the first turn. Preparation Roll three of the white dice. The player must assign the results to three values: (a) the total number of dice he will roll, (b) the number of those dice that will be boom dice, and (c) the total number of times he will roll those dice. Based on his selection, he takes the appropriate number of white dice and BOOM! dice into his hand. Determine the “BOOM!” number Roll the black “boom number” die. This number, if rolled a single time, will cause the bomb to first arm, and then explode. Roll the dice The player rolls his dice. If two or more of the “boom” dice show the bomb icon, the bomb has exploded, and the player’s turn ends. If the player rolls exactly one die showing the boom number, the bomb has been armed. In each subsequent roll, if the player rolls exactly one die showing the boom number OR ONE or more bomb icons, the bomb explodes, and the player’s turn ends. The player must continue rolling until he equals the number of rolls he selected during Preparation or until the bomb explodes, whichever comes first. Continue? If the player reaches his intended number of rolls, he may continue to roll the dice if he wishes. Each time, the same rules for arming/exploding the dice apply. The player continues rolling until he elects to stop or until the bomb explodes. Scoring If the bomb exploded, the player receives no points. Otherwise, he receives as many points as the number of times he successfully rolled the dice without the bomb exploding. The game ends when one player’s score exceeds a value agreed upon by the players at the start of the game. For a first game, 15 is recommended. During Preparation, Jim rolls 3-4-5. He decides that he will roll (a) 5 dice, (b) 3 of which will be red “Boom!” dice, (c) a total of four times. He rolls the “boom number” die, a 4. For his first roll, he rolls 1-2-6-6-B (B=bomb on a boom die). This is safe (he only rolled a single B; had he rolled 2xB, the bomb would have exploded). His second roll, he rolls 1-4-4-5-B. Because the 4 is represented twice, this is safe. His third roll, he rolls 2-2-4-5-B. The bomb is armed! His fourth and final roll, he rolls 2-3-5-6-6. This roll is safe. Jim may stop and receive 4 points. Jim decides to press his luck and roll again. He rolls 1-3-4-5-B. Boom! The bomb explodes, and Jim receives no points this turn. He passes the dice to the next player. The checkered blue flags of the cavalry flapped in the breeze as the general looked down the line of chariots with a grin. A storm was just about to roll into the province and the winds were sure to keep any arrows from flying true. Chariots are big and hard to deploy under normal circumstances, but the commander came prepared with his finest general to direct them. And with the aid of the weather slowing down any opposing archers, he was sure to strike first on this day and bring victory to his lord. On his orders, the chariots advanced slowly down the hill. One hoof clop lead to another and another. Waiting for a windswept volley of arrows which never came, the division moved steadily towards the enemy’s position. Faster and faster, the trot turned into a gallop. Unopposed, the horses reached their top speed soon after they hit the valley floor. But, just as they were about to cross the shallow stream coursing through the valley’s center, the confidence on the general’s face turned to horror. Sitting, waiting, quietly among the patch of trees on the other side of the stream, a division of elite infantry under the command of the opposing general now came into full view. The enemy archers had been a decoy. While his scouts had been surveying the opposing hills, a light unit of infantry had taken position behind the trees in the valley. Now, having successfully lured the unwieldly horse drawn carriages into the trap, the opposition burst from the cover of the trees and engaged. This battle would be over before it began. The general’s cavalry took heavy losses in the first wave, but the strength of the horses limited what damage could be done. After regrouping his men, he considered for a moment pressing forward while he had men in reserve to call upon but decided to sound the retreat instead. Exposed in front of the trees and far ahead of his own lines, there was little chance that his remaining cavalry could break this resistance before the enemy’s archers descended on their position. Sullen and discouraged, but alive, he recalled his days of study under the master as he rode away from the battle. - All warfare is based on deception. - This was not a battle of strength or of might, but a battle of wit and of planning. His men would lick their wounds over the winter and return in the spring. The battle was over, but the war had only just begun. Trials of Sun Tzu is a light dice game for control over ancient China. Only the commander with the superior art of war will earn victory on the battlefield, crush the will of his opponent and unify the Warring States once and for all. Give each commander (player) a set of twenty military dice and a blind. Shuffle up the eight province tiles and form a face down stack. Select one of the season dice at random and place the other two aside. Trials of Sun Tzu is a round based game. Each round is called a season and each season is divided up into four different phases. For the first season, turn over the top province tile. That province will be the first battleground. After the first season, one commander will choose a new battleground for the season, starting with the commander who lost the first battle. When it is your turn to choose a province, you may choose to turn over a new province or battle for an existing province which you do not occupy. After you have chosen, roll the season die to determine the weather condition. After the first season, swap the current season die for the next season die in the Spring, Summer, Autumn cycle before you roll. Behind your blind, separate your dice into two different groups and place one of those groups in front of the other. If you have units already on the province, remove them and place them in front of your blind. Once both players have chosen their troops, players lift their blinds and reveal their armies. The dice in the front group enter the battle. The other group remain behind (in the reserves). Roll your active units and count up the disorder (the number of black/white pips) on the top face of all your units. The player with the lowest total disorder has the initiative. If there is a tie, reroll. Red pips count as negative disorder. If you have the initiative, you may either attack or retreat. If you retreat, remove all your surviving units from the battle and add them to your reserves. If you attack, then select up to three of your units in the battle to attack with. Match each of your units against one, and only one, of your opponent’s units. You may match all of your units up against the same unit or they may be matched up two against one, or all against separate units (up to three) provided that all the enemy units share the same unit type (cavalry, infantry, archery or command). Once you have chosen the match ups, if the total strength (the black/white arabic numeral) of the attacking unit(s) is equal to or greater than the strength of the defending unit, eliminate the defending unit from the battle and place it in its army dead unit pile. Then, reroll the units you chose to attack and pass initiative to your opponent. Keep passing initiative back and forth until one commander retreats or all the units in one army have been eliminated. Places all the surviving units from the victorious army on the contested province and advance to the next phase. For each province you occupy that allows you to recruit or upgrade units, you may either add a basic unit of the corresponding type to the province or replace a basic unit of the corresponding type with a matching elite unit. Take the recruited unit or upgraded unit from those units which have been eliminated previously in the game. If you do not have any matching units remaining in your dead unit pile, then you may not recruit or upgrade that unit. After you have recruited and/or upgraded units, you may return one unit from each province your army occupies to your reserve pile. If you remove the last remaining unit on a province, you no longer occupy the province. Continue battling through the seasons until the final tile is turned over. At the end of that season, the commander who occupies three or more of five the divine mandate provinces wins. If neither commander occupies three or more of the divine mandate provinces, keep playing until one commander does. 2 players place dice into the 3x3x3 dice cube and score vertical, horizontal and diagonal sets of three of a kind. Roll the first starting die. a) at least one side of this die must touch any side of another die. b) Cube area can't be exceeded over 3x3x3. a) Sets are viewed from every 2d direction (from 4 sides and from top). b) All sets must include a die just placed! Game ends after the last scoring when the 27th die has been placed into the cube. Winner is the player with the most points. The players challenge each other in dice matches. The loser of a challenge is awarded 2 shamepoints. The first player to get 10 shamepoints loses the game (and the one with the least shamepoints win the game). From 2 to many players. Each side of a challenge has 8 dice and 2 special dice to roll. Attacker and defender dice should be in different colours. A higher number beats a lower number. The die with the lower number is out of the challenge. If there is a draw both dice is out of the challenge. Exception: a roll of 1 will beat the top number on an opposing die. Rolling a plus will add that number to the die you choose to strengthen. A minus will do the opposite, but the die has to be placed somewhere. Note: a minus 1 on a roll of 2 will not grant you the number 1 exception above. An arrow will beat the opposing die, no matter what number it has. A shield will block any number and also an arrow. Both dice remain in the challenge. A shield will not block a bomb. A bomb will blow out the opposing dice of both players. Both dice are out of the challenge (but not the special die itself). Swap two of your own dice in the lineup. This is not mandatory if you find no help in it. Available only to attacker. When the retreat symbol is rolled the attacker has the opportunity to retreat from the challenge to avoid losing. This way he only gets 1 shamepoint instead of the normal 2 shamepoints. The option is only available in that same round of the challenge. The die is not placed in the lineup. Something visible is needed to keep track of the score. Could be wooden disks (as in the GDS component list), a d10 for each player or plastic chips. Both attacker and defender roll their 8 dice. The rolled dice may not be altered until the round is finished. The attacker presents the first die he wants to use. The defender presents a die to meet this challenge and a new die to take the next blow. The attacker presents his next die to meet the new defender die. These three steps are repeated 4 times the first round, so that the lineup order is A-D-D-A-A-D-D-A-A-D-D-A-A-D-D-A. When the lineup is done both players roll their special dice. Once rolled the special dice are placed in front of any of your own dice to hopefully change the outcome of the challenge, the defender first and then the attacker. Both special dice may not be placed in front of the same die. When all losing dice are removed the two players roll their remaining dice again and play a new round (if none of them gives up voluntarily). The lining up stops when one player has placed all his remaining dice and the other player has placed the same number of dice (if he has more dice left these are not used in that round). Then the special dice are rolled and placed as normal. The challenge continues until the attacker retreats, one of the players give up or until one player has lost all his 8 dice. The loser is awarded 2 shamepoints. The winner of a challenge picks one of the other players to be the next attacker. The attacker may attack anyone which has not more than 2 shamepoints more than himself. If everyone else has more shamepoints than that, then he may attack the one closest to him in shamepoints. Normally the game ends when the first player gets 10 shamepoints, but it is also possible to play “last man standing”: continue the game until all but 1 player is out of the game with 10 shamepoints. Judgement day is near and the great Unnamed God will soon reward the devoted and punish the unfaithful. In Auctions And Alms, each player is a high priest for a faction of worshippers of the great Unnamed God. In each of three rounds, players will be competing to best use their follower's offerings to make the best possible sacrifice in order to gain the Unnamed God's favor. 16 custom 6-sided "offering" dice: each with four sides showing a monetary value of 1-4, and two sides with one of the 4 sacrifice types (human, animal, grain, artifacts). 2 "wrath" cards showing a lightning bolt. At the beginning of the game each player takes 3 dice randomly from a bag. 1 die is set aside to be used as the starting auction die. Any remaining dice will not be used in game play. The game is played in 3 eras. Wrath Cards: If a wrath card is flipped, the current auction lot is destroyed by the Unnamed God and discarded for the rest of the current era. Place the wrath card face up beside the draw pile. An era is over when all 16 cards have been auctioned, or when all players have at least 3 cards, or when the second wrath card is drawn. 1 devotion point is awarded for each sacrifice type to the player who has the highest quantity of that sacrifice type, including cards and dice showing a sacrifice side. Dice showing a monetary value are worth nothing here. In the case of a tie, no point is awarded. Players will also keep tally of their quantities of each sacrifice type, This will be used in final scoring. Repeat the steps for "Era Setup" to "Era Scoring" for three eras. Once three Eras have been completed and scored, the great Unnamed God will pass judgement on the players. 2 devotion points are awarded for each sacrifice type to the player who has the highest cumulative quantity of that sacrifice type. In the case of a tie, no points are awarded. Each player's devotion points are summed. The player with the most points wins, and will be spared. The losing players are all violently destroyed by the Unnamed God. A dice game of aerial dogfights between fighter planes and flying robots. Three custom, six-sided, fighter plane dice. Three custom, six-sided, flying robot dice. Plays two to six players with one set. Up to twelve players with two sets. Divide the players into two teams, evenly as possible. One team plays the pilots of fighter planes and the other team plays the pilots of flying robots. Each player plays at least one pilot. If there are an odd number of players, one of the players on the smaller team can play two pilots to even things out. Play with at least six pilots, even if you have fewer players. The twelve-sided dice are Position Dice. Each player gets one Position Die and one (team approriate) Action Die per pilot they are playing. All the players roll their Position and Action Dice at the same time, keeping each pilot's results separate. The round's effects are determined in order of the Position Die results, from highest to lowest. The better a pilot's Position result, the more advantageous position her plane or robot has in the sky, the more targets she can pick from, and the fewer opponents who can target her. Position result ties generally don't matter because you can only affect pilots with Position results less than—not equal to—your own. If there's any contention over who goes first on a tie, roll the Position Die again. Whoever rolls higher goes first among those who tied. Use your original Position result to determine who you can target if you Fire. Crash: Your plane or robot crashes and the pilot is eliminated from the dogfight. But first, describe falling out of the sky, the horrific explosion that followed (making explosion sounds), and how your pilot ejected to safety. Fly: Your plane or robot stays in the air, unscathed for another round. Describe how you evaded fire and shook that bogey off your six. Make engine noises with your lips and swoosh your hand through the air to illustrate your precision maneuver. Fire: You can either fire your machine guns / plasma blasters at an enemy or provide cover fire to help a friend. Attack an enemy: pick a target among your opponents with a Position result less than yours. Reduce the result of his Action Die by one step (Fire becomes Fly or Fly becomes Crash). Describe your pilot pulling the trigger in the cockpit and how her machine wrecks havoc on her target. Make machine gun sounds or plasma blaster noises. Help a friend: pick a target on your side with a Position result less than yours. Increase the result of his Action Die by one step (Crash becomes Fly or Fly becomes Fire). Describe how you tell your friend to "pull up!" over the radio or trick an enemy to fly right into his sights. NOTE: sometimes your won't have any targets with lower Position results or those who do you won't be able to affect any further. In that case, just treat this like a Fly result and quickly move on to the next round where more adventure awaits! When you're donw with your turn, pick your dice up off the table. No one can target you for the rest of the round. Cheer on your friends. After everyone has had their turn, start a new round. If you crash and burn, set your dice aside. If you still have another pilot to play, keep on playing her. Otherwise, sit back and cheer on your friends. Dogfights go fast, so you won't be out of the game for long. When all of the pilots from one team have crashed, the team with remaining pilots wins the dogfight! It's a quick little game, so pick up the dice and play again! Any number of players, divided onto two teams, with a leader to make the final decisions. For large numbers of players, just add more sailor dice. These rules will assume a two player game, but how multiple players, or rather multiple hands, enters into the gameplay should be obvious. Roll all 60 12mm sailor dice onto the table. These are the sailors from the wrecks of two rival pirate ships, treading water in the ocean (it helps if your table is blue). Place the 5 Desert Island tiles on the table, roughly surrounding the sailors. Both players choose a color. Determine the starting player. At the beginning of a player’s turn, he indicates a Desert Island to be the one that his sailors are swimming towards, and then his opponent does the same. Both players may choose the same island. He then rolls both Captain Dice, keeping them separate from the sailors. Both players then simultaneously pick up as many sailors as they can which correspond to the Captain Dice. So, for example, if the Black Captain Die rolls a 6 and the White Captain Die rolls a 2, players pick up as many black sailor 6s and white sailor 2s out of the ocean as they can. They may only use the thumb and index finger of one hand while doing this, and may only pick up one die at a time. These dice must be held in the hand that is picking the dice up. After no more dice can be picked up from a Captain roll, both players reveal the sailors they have picked up and place the sailors of their own color on the island that they indicated earlier. All the sailors of the opposing color that a player has picked up are rerolled back into the ocean. The Captain Dice are now passed to the other player, who begins his turn. When the Captain Dice roll doubles, the players shout “Sharks!” and, again pick up as many of the correct dice as possible. However, in this case, all opposing sailors that are picked up are eaten by sharks and removed from the game, while allied sailors are rerolled back into the ocean. Then, all the dice in the ocean are rerolled (to prevent the ocean's number distribution from becoming stale), and the Captain Dice are passed to the other player. The game ends after the third time that doubles are rolled and the sharks have been fed (the game becomes quite intense after the sharks have fed twice). Players look at the desert islands and determine which player controls which island, by seeing which player has more sailors there. If the number of sailors is equal, neither player controls the island. The player who controls the most islands wins the game. If the players are tied, the player with the most sailors altogether on islands wins the game. If this is tied, the player with the least number of sailors in the ocean wins. Players can play offensively or defensively by focusing on picking up their own colors or those of their opponents (thus denying those dice to that opponent), depending on how many correct dice he sees his opponent could pick up, and which island he is swimming towards. They can also keep track of which numbers are available in the ocean, to speed their snap decisions on what to pick up, and what numbers they have run out of. The choice of an island to swim to is the critical strategic decision in the game, while the players’ real-time perception, dexterity and snap decision making skills decide its effectiveness. Shipwrecked provided some intense playtests. The game produces pleasant feelings of panic, desperation, and glee through the use of the players’ survival instinct, the Sharks! revenge mechanic, and the uncertainty of when the ending turn will be. It nearly always provides a path to victory even for lagging players, and rewards practice and skill. While the "gameboard" is not listed as an acceptable component, it can easily be supplied by the player (from a completed sudoku puzzle), or could be on a half-sized card. If the core game play is compelling (which I believe it is), there is some room to play with the component mix. Gameboard Wrap The gameboard wraps around. That is, the top space in any column is considered adjacent to the bottom space of that column. Likewise, the leftmost space in any row is considered adjacent to the rightmost space of that row. Nightshade and Milkweed are fighting for dominance in the abandoned garden. Whoever claims the most spaces in the garden wins. Each player will need a pen, preferably in different colors. Each player starts with 4 dice in their supply and a pen. Each player rolls one die and adds 2 to get a number between 3 - 8. Nightshade claims one space which matches his or her number by marking it with his or her pen. Then Milkweed claims one space which matches his or her number by marking it with their pen. Players repeat this process, so that each player starts the game with 2 claimed spaces. Milkweed starts the first round, as described below. At the start of each round, both players roll all dice in their supply (4 dice each in the first round). Then, players alternate turns. Each turn, a player must either claim a space, re-roll, or pass. Claim a space by discarding the matching card, setting aside dice that total to exactly the number on the space, and then marking the space with their pen. You can only claim an empty space orthogonally adjacent to a space you previously claimed. Note that you only have one card of each number, so you cannot claim two spaces with the same number during the same round. Some spaces do not have numbers on them. These spaces cannot be claimed by either player. For example: Milkweed rolls a 1, 2, 4, and 5 on his first turn. He previously claimed a space next to a 10 space. He can discard his 10 card, and set aside the 1, 4, and 5 dice to claim that space. On his next turn, if there is an empty 2 space adjacent to one of the spaces he has claimed so far, he can discard his 2 card, set aside the 2 die, and claim that space. You can discard any number of cards to re-roll that many dice. You only re-roll the dice once, and you can't discard more cards than you have remaining dice. Dice set aside to claim spaces may not be re-rolled. For example: Nightshade rolls four 6s on his first turn. How unlucky! The spaces he claimed previously are not adjacent to any 6 spaces, so he discards 3 cards, and re-rolls 3 of the dice. If you have no dice remaining, or no cards remaining, you must pass. You may choose to pass earlier. The first player to pass adds a die to his or her supply (for the rest of the game). The other player may take any number of additional turns. The next round starts with the player who played last (and did not get the additional die). Each player cannot have more than 10 dice in their supply, but the game usually ends before this point. At the end of each round, each player gets back all of their cards, and all of the dice in their supply. The game ends when each space has either been claimed or blocked off from the other player. Spaces that can only be claimed by one player are claimed now. Whichever player claimed the most spaces (there are 72 in all) wins. If each player claimed 36 spaces, then whoever claimed the most 10 spaces is the winner. Appendix: Creating a game board. To create a game board from a completed Sudoku puzzle, first change the 1 spaces to 10s (by annexing a 0). Then block out the 2 spaces (to create the obstacles in the board). You are now ready to play. A game of skill, luck, and strategy, in that order, for 2-12 players. Place the four black dice so that they frame a 2'x2' square - this is the playing field. 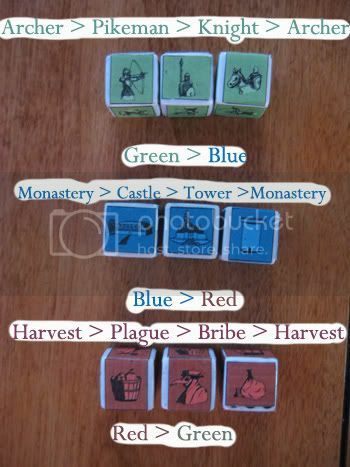 Divide the red dice evenly among all players, rolling any leftovers into the field; do the same with the blue. Each player rolls one green die onto the field; the player with the largest number goes first (settle ties by rerolling). Roll the rest of the green dice into the field. Shuffle the Achievement cards, and turn three of them face-up onto the table. Players take turns throwing dice into the field. On your turn, choose one of your dice and roll it onto the field. You must release the die before your hand reaches the edge of the field. Keep track of which dice your die hits, and once your die stops rolling, gain points equal to the sum of the top faces of all of those dice, counting stars and diamonds as 7s. In addition, capture all dice your die knocks out of the field - you don't gain points for them, but you add them to your collection of dice. Red - Instead of gaining points for dice you strike, capture them; in addition, lose points equal to twice the top-facing side on your own die. Blue - Before you roll, choose a color; only gain points for dice you strike of that color, but gain twice as many points for those dice. Green - Gain additional points equal to twice the top-facing side of your own die. However, if your die doesn't end in the field (usually because you roll too hard and it passes all the way through the field), you forfeit your turn instead; roll your die and any others knocked out of the field back in, but don't collect any dice, gain any points, or fulfill any Achievements as a result. There are 18 Achievement cards, each listing a Goal and a Reward. Up to three will be face up at any time. If, on your turn, your throw accomplishes the Goal listed on a face-up Achievement, its Reward immediately occurs. Then, discard that Achievement card and flip over a new one from the deck to take its place. - Goal: Strike two dice with sixes on their tops. - Reward: Gain 10 points. - Goal: Capture all dice that were on the field at the start of your turn. - Reward: Take all green dice from all players, place them in the field, and take another turn. - Goal: Throw without hitting any other dice when there are at least ten dice already on the field. - Reward: Place the two halves of the game box anywhere on the field; remove them at the beginning of your next turn. - Goal: Strike five dice that have stars visible (i.e. on faces not point straight down). - Reward: Capture those dice (in addition to gaining points for them). - Goal: Indicate a die in the field before you throw, then knock that die out of the field with your throw without disturbing any other dice. - Reward: Take an additional turn. - Goal: Strike exactly three dice: a red die, a green die, and a blue die in that order. - Reward: Choose a color; until your next turn, players can only throw dice of that color; players who don't have dice of that color skip their turns. - Goal: Roll a diamond. - Reward: Recapture the die you rolled. - Goal: Throw from at least three feet from the field and have your die end in the field. - Reward: Gain 4 points for every die on the field (including the one you just threw, and in addition to any normal points you gain for the throw). Any player who runs out of dice loses. If only one player is left, that player wins. Otherwise, the game ends once all 18 Achievements have been accomplished, and the player with the highest score wins. Settle ties by rolling die until one player rolls higher than the others; that player wins. Eliminate your opponent's dice and claim victory. In Pocket Wars, you and your opponent are two forces vieing for power. You both engage in battle using a Rock Paper Scissors style of combat to determine who will ultimately be the supreme ruler. Each player takes 3 of each colored die. 3 green, 3 blue, and 3 red. These dice comprise the player's war machine. Each colored set of dice has 3x2 faces on them. Each player keeps their dice from view and decides what 3 dice they will play. Then when both players are ready one person says “1-2-3 Shoot” and both players place their 3 dice in front of each other simultaneously such that both sets are matched up symmetrically. You now go through 3 'matches' where you determine who wins each. You determine which player won each of the three matches starting on the "shoot" caller's left. The loser removes each of his die and places it off to the side. It is permanently lost. However, after each of the three matches, the winner gets to check what additional benefit he receives and if it is applicable, applies that benefit before moving on to the next matchup. After the last matchup, that entire round of combat is over. The surviving dice are returned to each player and a new round begins. This time the other player calls “1-2-3 shoot” and matching is done from that player’s left to right. Repeat the above steps until one player no longer has any dice. Please refer to the below image to determine what beats what. When you win a match, one of the following conditions occurs only for the duration of that combat round.